We aim to give a friendly and professional service to all our patients. However, if you have any concerns about any aspect of our service, please let us know. In any organisation, things do go wrong. If this happens we want to know so that we can try and prevent problems in the future. If you need to make a complaint about any services received at Woodhouse Health Centre, please direct these in person or in writing to our Compliments and Complaints Manager. If you require a copy of our complaints procedure, please ask at reception. 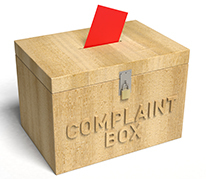 For a copy of our complaints form, please click here.